What do you suggest or what is your favorite? As a Pappagallo’s Satellite Beach crew member we get asked this questions a lot. It is so hard to just name one thing. There are so many good things on the menu. Oh and if there is a Special of something not on the menu then you should get that!! So helping new customers or even regular customer pick something out is not an easy task but you can’t go wrong with an choice. So I usually start off by asking what they might be in the mood for. Maybe the suggestion comes from what I am craving or something good that i just saw go out of the kitchen. Usually start by trying to figure out what they might be in the mood for: Pizza, Pasta, Calzone, Stromboli, Salad, Burger for the main dish that is. Then there’s what shall we start with? For appetizer the suggestion comes from “you can’t get this anywhere else.” Dave and the cooks hand roll the homemade fried cheese. These aren’t your normal Mozzarella cheese. When you bite into them they are still full of cheese. They have often been called “cheese pillows.” Now there is 3 kinds to choose from: the not so “Regular” fried cheese. Made with high quality Monterey Jack cheese. Next is the Florentine fried Cheese. This is a Dave creation. A creamy blend of Ricotta, Parmesan, Mozzarella cheese, and to make it “healthy” – Spinach. The for those hot heads… Habanero Fried Cheese: Yet another Dave creation. A spicy blend of Cheese with Bacon and this one comes with the Homemade Ranch dressing for dipping. In Pappagallo’s Satellite Beach style we make the Soups in house always. Your server will need to tell you which soup we have for today. Nonna and Dave are always making something new. The traditional Pasta Fagioli that goes nicely with the Lunch Special which comes with homemade cheesy bread. The Minestrone has a funny story. Nonna was the only one to make it for a while. She was leaving to go visit her mom in Italy and left Dave a handwritten recipe. So when Dave went to make it the first time and he read the directions he couldn’t help but laugh. It went something like this. Sprinkle of this a hand full of this, and this if you have it or you can use this. Right then and there Dave decided that he would just wait until she got back to learn how to make it. Chicken Chilli is a favorite of many. You know when the staff gets excited about something and can’t wait to get some for their next meal it’s a good choice for all. This recipe was originally made for a salad. The chilli would go on top of the salad with the amazing “Tortilla Crunchies” and you didn’t need dressing. Our customers loved the chilli so much they begged Dave to make a soup out of it, and he did! Homemade pizza can be made as Healthy or Unhealthy as you would like or as your cravings and will power can handel. Sometimes your in the mood for something lighter but with lots of flavor. Have you tried the Garlic Pizza? There is no Marinara on this pie. It is replaced with Olive Oil, Garlic, and a nice blend of spices. Now that you have your base you can top it “Healthy” or Unhealthy.” Sausage and Onion is usually a go to. Looking for something new or spicy then you need to try the Buffalo Chicken pizza. This is a Specialty Pizza! Marinara is not legal on this pie. The base is made with our Homemade Ranch dressing mixed with our homemade Buffalo wing sauce. Topped with crispy chicken and 2 types of cheese. To put an “original” spin on it add Broccoli and Bacon. That was how Dave made the very first Buffalo Chicken Pizza. Are you a cheese lover like me? Well then you have to try the 3 Cheese White pizza. The first time I tried and actually like a white pie was at Pappagallo’s. The Ricotta mixture of cheese and spices is spread onto the pizza like the Marinara. Most places glop it on here and there. This gives each bite the wonderful flavor of all the cheese. What to put on top of these cheeses??? Well you could put anything from Ham to chicken or just leave the yummy cheese alone. Sometimes you crave just the Original Cheese Pizza (no toppings). Top it the Healthy way with all fresh vegetables. Choose from any of the high quality meats which ever may tame your cravings. All of the above can be made into a Calzone or Stromboli with expectation of the garlic… while our Pizza crew can make it happen for you the hot oil coming out of a Calzone or Stromboli might be quite the mess. The menu has a list of Specialty combinations for the Calzones and Strombolis, a lot of the names came from one of the past crew members or their idols. For example the Rocky (Dave’s idol), Angry Meatball (Crew), but of course The Godfather (no explanation needed), Davinci (never question the man who knows it all). Some were created to help some of our regulars to place their order easier: The Meat Lover, Veggie, and the Tree Hugger. We had to turn the Buffalo Chicken pizza into a Calzone and Stromboli just to give you more options. Speaking of regulars, we have some named pizza’s that haven’t made it on the menu. The Penny’s Pizza or the Al’s Pie. Those will be described for you in the next blog. 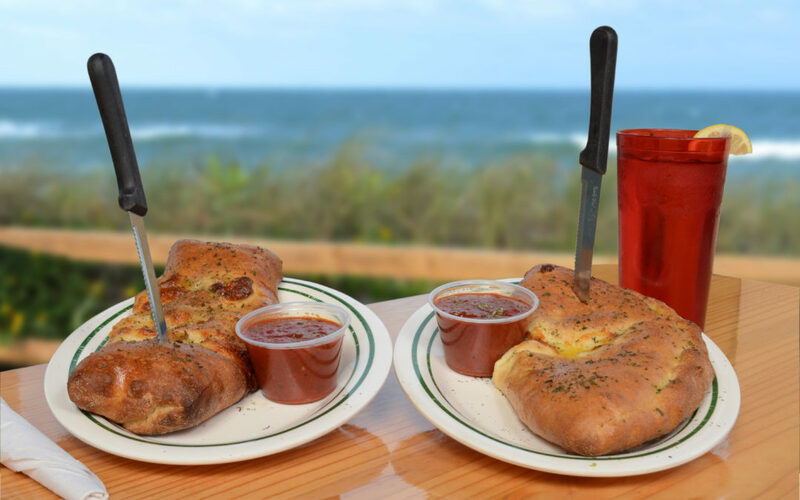 Stay tuned for more food suggestions at Pappagallo’s Satellite Beach.